Bon Appetit, June 2011. 4 servings. I enjoyed this recipe so much that I was ready to make it again the next day. This came from Gwyneth Paltrow’s cookbook, in which was discussed in Bon Appetit. This dish could be described in one word: delicious. The slow roasted tomatoes really added oomph to the dish, but it took 3 hours to do, which wasn’t bad if you have the time, but don’t skip it! Preheat oven to 200°. 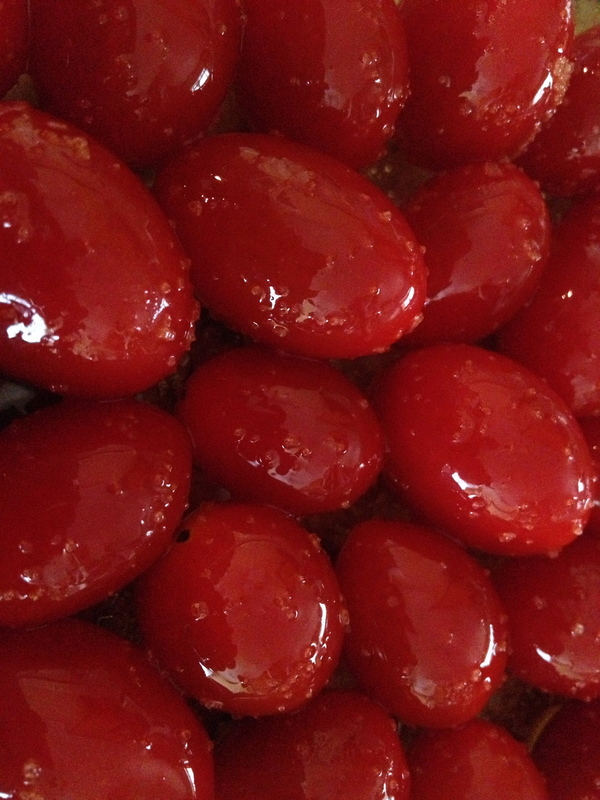 Place 2 cups tomatoes in 8x8x2″ glass baking dish. Stir in 1 tbsp oil and a large pinch of salt. Roast, stirring occasionally, at least 3 hours. Set aside. Increase oven temperature to 400°. In a small bowl, combine breadcrumbs and herb, season with salt and pepper. Drizzle 1 tbsp oil over, stirring until mixture resembles damp sand. On a parchment paper-lined baking sheet, lay anchovies about 1/4″ apart. Evenly pack breadcrumb mixture over; drizzle with 1 tbsp oil. Bake until golden brown, 5 minutes; set aside. Meanwhile, crush the remaining 2 cups of tomatoes in a large bowl with your hands. [Don't discard the juices that are collected in the bowl. They go into the pan.] Heat 4 tbsp oil in a large skillet over medium-high heat. Add garlic; cook, stirring, 30 sec. Add crushed tomatoes and a pinch of salt; cook, stirring occasionally, until juices thicken, 6-7 minutes. Add roasted tomatoes. Add drained spaghetti to skillet; toss to coat, adding reserved pasta water by 1/4-cupfuls if dry. Remove from heat; stir in basil. Drizzle with remaining 2 tbsp oil. Divide among bowls. Top each with 1/4 of the anchovy oreganata.